I love to write although nowadays I’m trying to transition more to vlogging. My book, The Jazz Process: Collaboration, Innovation and Agility, published by Addison-Wesley in 2010, is a treatise on collaboration, innovation, and agility that can help teams in any domain improve their performance. The book has been endorsed by a diverse collection of thought leaders and praised by reviewers. An insider’s guide to translating the creative techniques of jazz to the business world. The 14 fundamental principles found in this book are essential to any collaborative venture. Cho lays out a clear path to achieving elegant teamwork, goal-oriented project completion, and winning results. Jazz demands cooperation, enterprise, creativity, measured risk, and so much more—and so does business. Adrian’s book is an entertaining guide for importing the jazz process into the world of business. This book has an important message: Effective collaborations are like jazz improvisations. Jazz succeeds because the group shares just the right kind of rules and structures; business teams also need to improvise within the right kind of structure. Cho has years of experience playing jazz and working in business teams, and in this book he applies this experience to analyze the ways that effective business teams balance structure and freedom. In the Jazz Process, Adrian Cho weaves some unusual and interesting four-part harmony between jazz, business, sport, and information technology around an important theme… teamwork. Adrian Cho’s insight into high-performance teams is drawn from his personal experiences in music, business and software engineering. Within the Eclipse community we have seen many of these ideas in action and they work. I highly recommend the Jazz Process to anyone seeking to learn how to build agile, effective teams—regardless of your field of endeavour. The Jazz Process will open your eyes to a different way of thinking about teams, business, and software development. It’s a huge payback for the time invested in reading it. Teaches how to collaborate more effectively both within the team and with customers and outside interests. A top pick for any business collection! 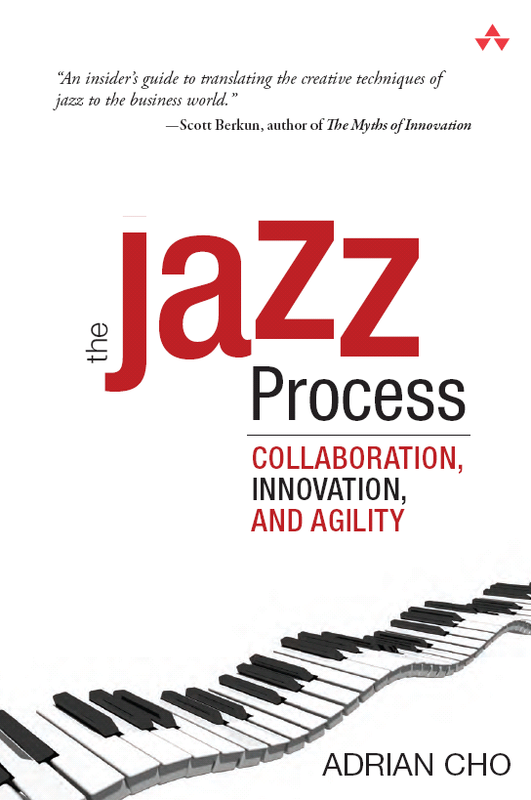 The Jazz Process provides a very engaging discussion of innovation and innovation processes. Cho provides ample discussion of jazz to support his arguments and provides nine pages of excellent references for further examination. Cho’s examination of innovation and collaboration through the lens of music offers an interesting view of collaboration and creativity in innovation processes. I found the book useful because it made me more aware of how to be a good team member. For people who want to improve the performance of a team, this book may be particularly helpful. There is a lot to take in in this book, which is a credit to Cho’s experience and dedication to the Jazz Process which he has elaborated. Furthermore, as someone who works in both music and IT, it does make sense and fit in with my experience, unlike some business books I have read in the past. Overall it is very good. A deep exploration of collaborative know-how…a concept of leadership and teamwork that’s well suited for the Google-age workplace. getAbstract recommends this innovative book to human resources professionals, executives and managers needing new harmonies, and employees who know they could make a better contribution if only someone would let them play a solo. Both books on innovation address the subject passionately and informatively. The Jazz Process is about team building and collaboration; Innovate the Future is about targeting a market segment and implementing a product successfully. They are vastly different applications of innovation, but could be attractive to someone who is looking for that particular innovative niche. It was with much joy that I jumped into Adrian Cho’s The Jazz Process and bought into his illustrative mental model for better understanding how collaborative performances should occur with diverse talent. As a management consultant and executive leadership coach, I have been able to expand my tool kit and framework through Cho’s fine work. What makes this book incredibly useful is Cho’s journalistic approach to expanding his solid credentials in the agile development space with in-depth stories concerning special moments in jazz history or professional basketball championships. I really enjoy reading this book that propose a deep and interesting perspective on the team dimension of software development with multiple references to the jazz and sports domains…The flow of the book is very good, making it enjoyable to read and a recapitulation at the end of each chapter points out the main ideas conveyed in the text. I will recommend this book to every people involved in software development, especially at the management level. It is full of interesting thoughts on the topic that you will enjoy even more if you are in addition fan of jazz and sport. Aside from appreciating the base metaphor, I also like the content a lot. It includes a number of insights that are common (hire good performers, enable them to lead as needed, watch the health of the team) and some that are not. The discussion of feedback loops and “hunting” is particularly rare. Even rarer, it discusses the good and bad points of its advice, instead of merely advocating One True Way.